Where in the World is Puerto Rico?. 1 Where in the World is Puerto Rico? Goal/Overview Students will discover important facts and places regarding the Commonwealth of Puerto Rico while relating these facts and places to the culture of the United States and the other 20 Spanish-speaking countries for the world. 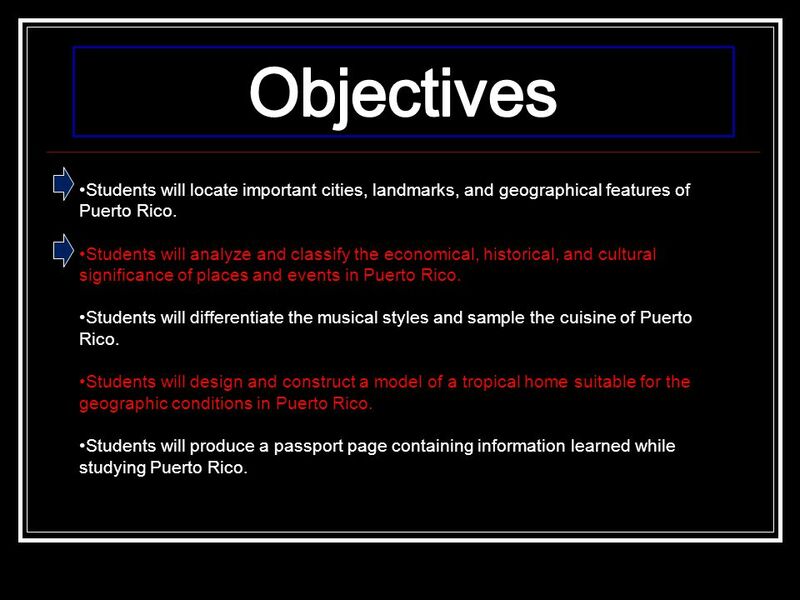 3 Objectives Students will locate important cities, landmarks, and geographical features of Puerto Rico. Students will analyze and classify the economical, historical, and cultural significance of places and events in Puerto Rico. 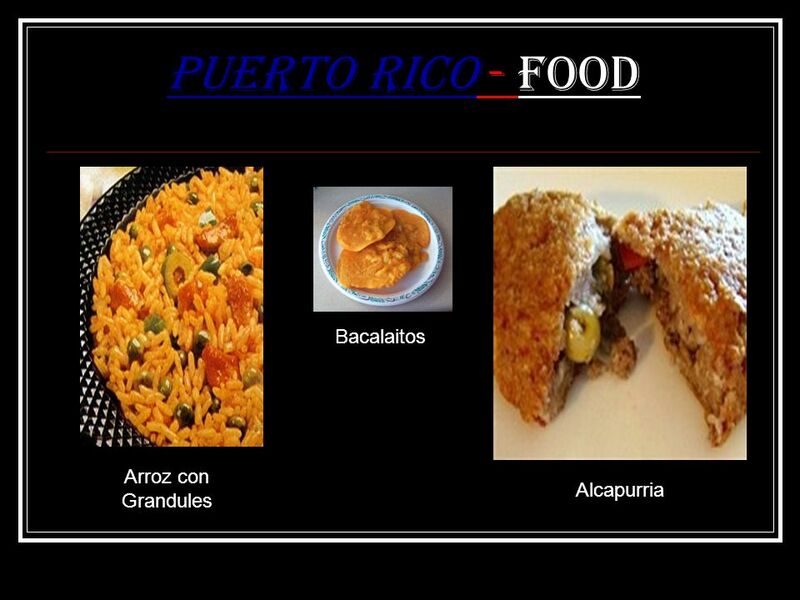 Students will differentiate the musical styles and sample the cuisine of Puerto Rico. Students will design and construct a model of a tropical home suitable for the geographic conditions in Puerto Rico. 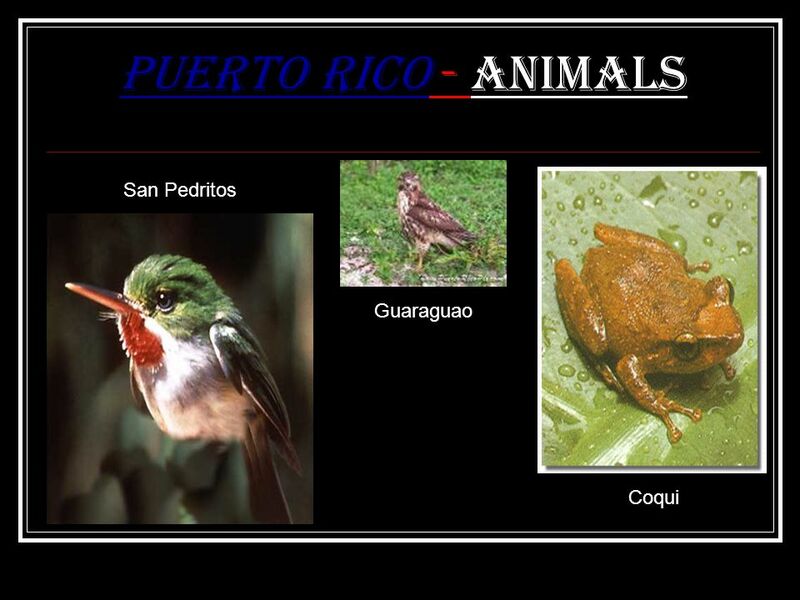 Students will produce a passport page containing information learned while studying Puerto Rico. 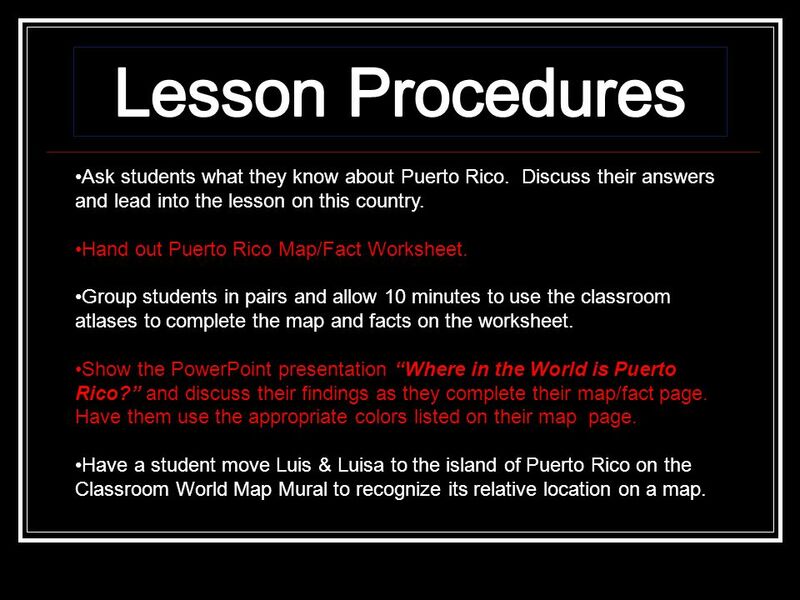 4 Lesson Procedures Ask students what they know about Puerto Rico. Discuss their answers and lead into the lesson on this country. Hand out Puerto Rico Map/Fact Worksheet. Group students in pairs and allow 10 minutes to use the classroom atlases to complete the map and facts on the worksheet. Show the PowerPoint presentation “Where in the World is Puerto Rico?” and discuss their findings as they complete their map/fact page. Have them use the appropriate colors listed on their map page. Have a student move Luis & Luisa to the island of Puerto Rico on the Classroom World Map Mural to recognize its relative location on a map. 5 Puerto Rico - Location Puerto Rico is an island in the Caribbean Region, also known as the West Indies. It is composed of an archipelago, which includes the main island of Puerto Rico as well as a number of smaller islands and keys. 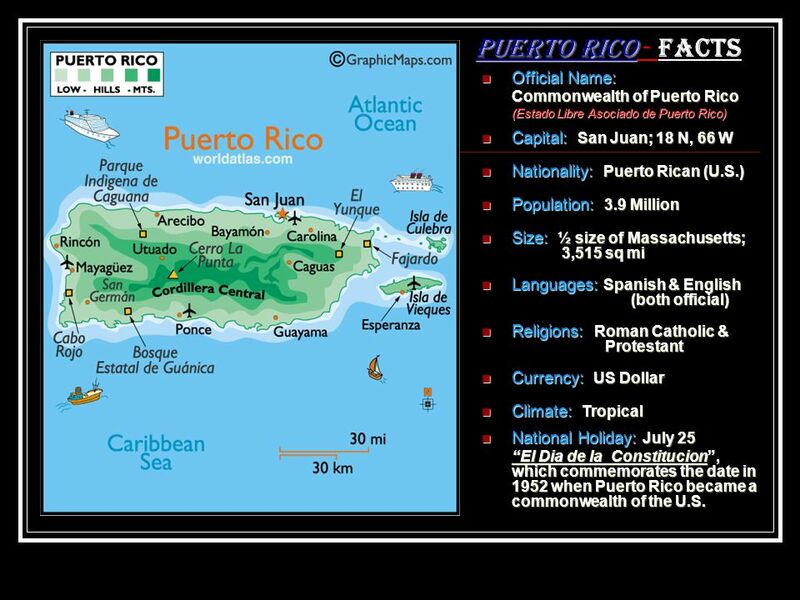 Commonwealth of Puerto Rico (Estado Libre Asociado de Puerto Rico) Capital: San Juan; 18 N, 66 W Nationality: Puerto Rican (U.S.) Population: 3.9 Million Size: ½ size of Massachusetts; ,515 sq mi Languages: Spanish & English (both official) Religions: Roman Catholic & Protestant Currency: US Dollar Climate: Tropical National Holiday: July 25 “El Dia de la Constitucion”, which commemorates the date in 1952 when Puerto Rico became a commonwealth of the U.S.
7 Map of Old San Juan, Puerto Rico outside of the Capital building. 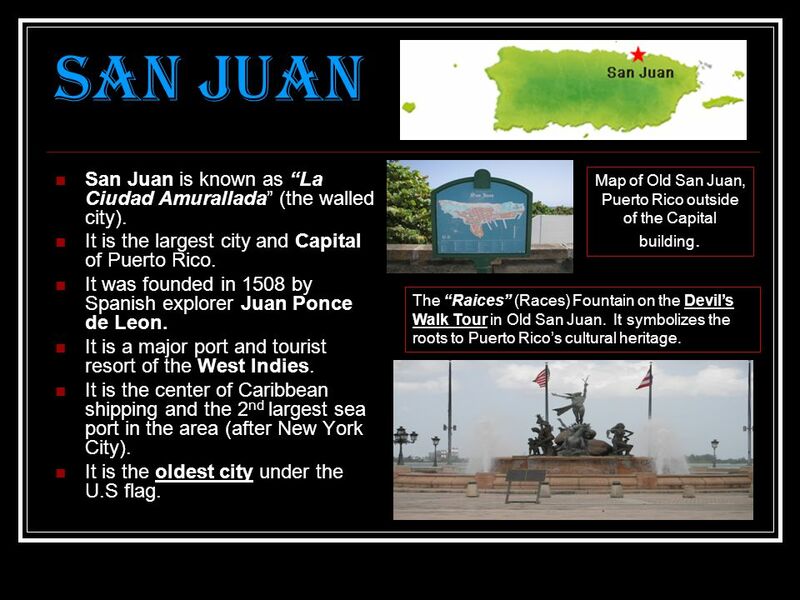 San Juan is known as “La Ciudad Amurallada” (the walled city). It is the largest city and Capital of Puerto Rico. It was founded in 1508 by Spanish explorer Juan Ponce de Leon. It is a major port and tourist resort of the West Indies. It is the center of Caribbean shipping and the 2nd largest sea port in the area (after New York City). It is the oldest city under the U.S flag. Map of Old San Juan, Puerto Rico outside of the Capital building. The “Raices” (Races) Fountain on the Devil’s Walk Tour in Old San Juan. It symbolizes the roots to Puerto Rico’s cultural heritage. It is Puerto Rico’s 2nd largest city. It is also called the “Ciudad Senorial” (Majestic City) because of its many beautiful neoclassical buildings and facades. It was founded in 1692 by Loiza Ponce de Leon, the great grandson of Juan Ponce de Leon. 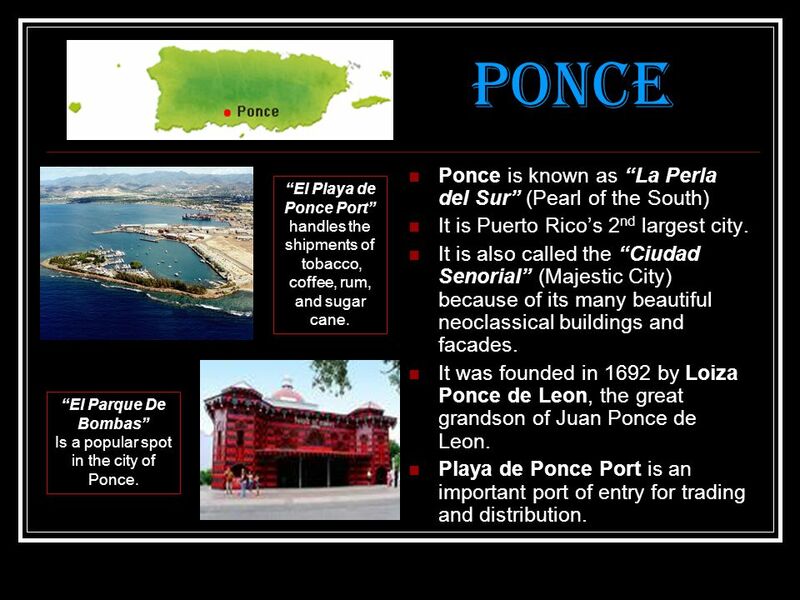 Playa de Ponce Port is an important port of entry for trading and distribution. “El Playa de Ponce Port” handles the shipments of tobacco, coffee, rum, and sugar cane. “El Parque De Bombas” Is a popular spot in the city of Ponce. 9 Las Fiestas de Santiago is in full swing in the streets of Loiza. 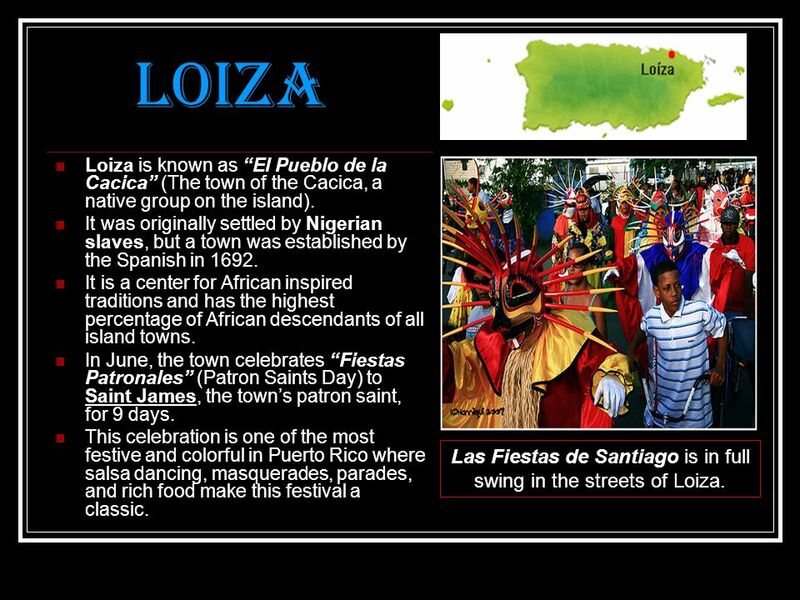 Loiza is known as “El Pueblo de la Cacica” (The town of the Cacica, a native group on the island). It was originally settled by Nigerian slaves, but a town was established by the Spanish in 1692. It is a center for African inspired traditions and has the highest percentage of African descendants of all island towns. In June, the town celebrates “Fiestas Patronales” (Patron Saints Day) to Saint James, the town’s patron saint, for 9 days. This celebration is one of the most festive and colorful in Puerto Rico where salsa dancing, masquerades, parades, and rich food make this festival a classic. Las Fiestas de Santiago is in full swing in the streets of Loiza. 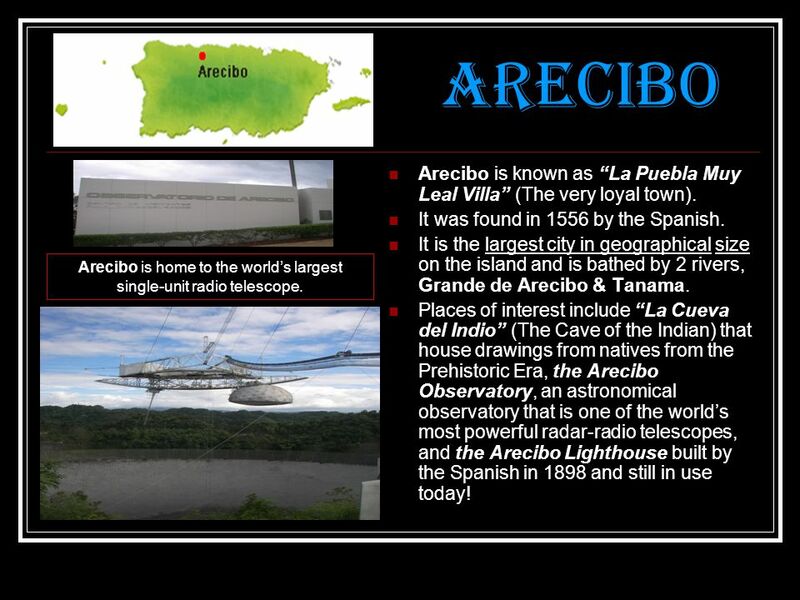 10 Arecibo Arecibo is known as “La Puebla Muy Leal Villa” (The very loyal town). It was found in 1556 by the Spanish. It is the largest city in geographical size on the island and is bathed by 2 rivers, Grande de Arecibo & Tanama. Places of interest include “La Cueva del Indio” (The Cave of the Indian) that house drawings from natives from the Prehistoric Era, the Arecibo Observatory, an astronomical observatory that is one of the world’s most powerful radar-radio telescopes, and the Arecibo Lighthouse built by the Spanish in 1898 and still in use today! Arecibo is home to the world’s largest single-unit radio telescope. El Yunque is a cool, mountainous, subtropical rainforest on the Eastern side of the Luquillo Mountains. It covers over 28,000 acres of tropical forest and is home to over 240 species of trees, plants, and animals. 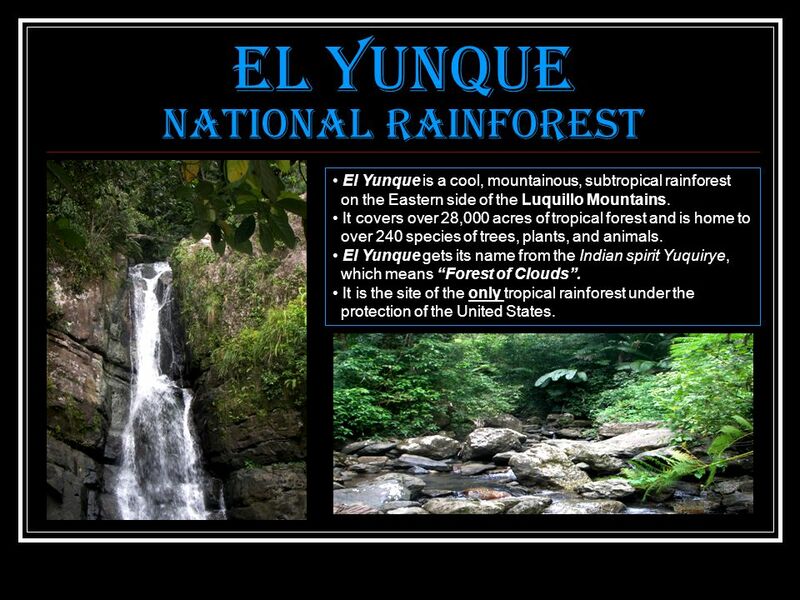 El Yunque gets its name from the Indian spirit Yuquirye, which means “Forest of Clouds”. It is the site of the only tropical rainforest under the protection of the United States. 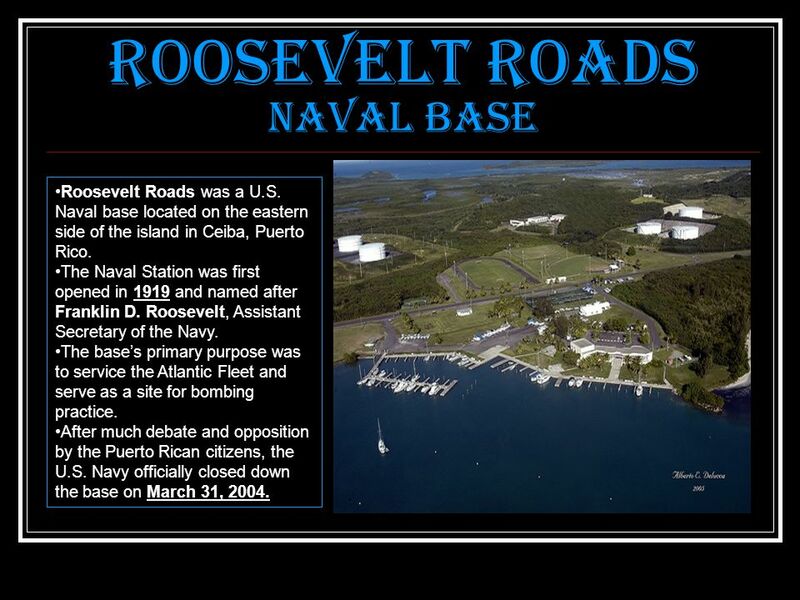 Roosevelt Roads was a U.S. Naval base located on the eastern side of the island in Ceiba, Puerto Rico. The Naval Station was first opened in 1919 and named after Franklin D. Roosevelt, Assistant Secretary of the Navy. The base’s primary purpose was to service the Atlantic Fleet and serve as a site for bombing practice. After much debate and opposition by the Puerto Rican citizens, the U.S. Navy officially closed down the base on March 31, 2004. 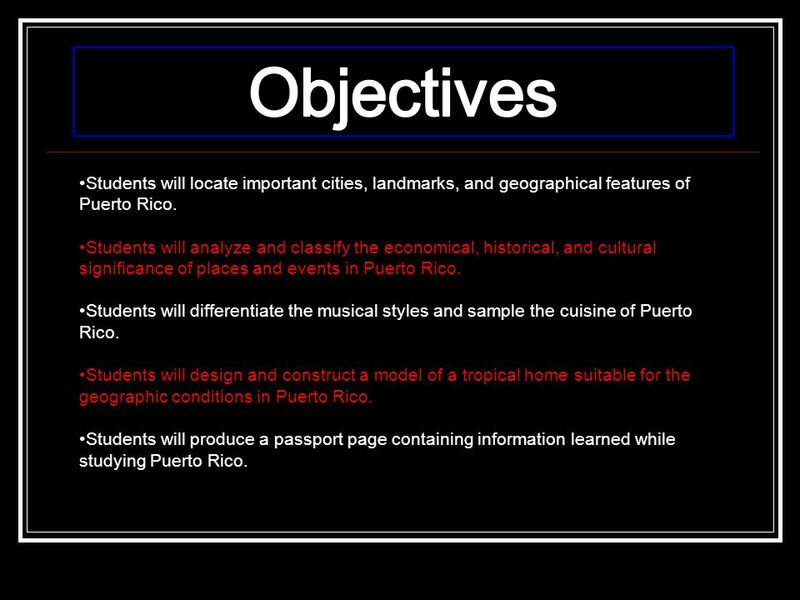 14 Objectives Students will locate important cities, landmarks, and geographical features of Puerto Rico. Students will analyze and classify the economical, historical, and cultural significance of places and events in Puerto Rico. 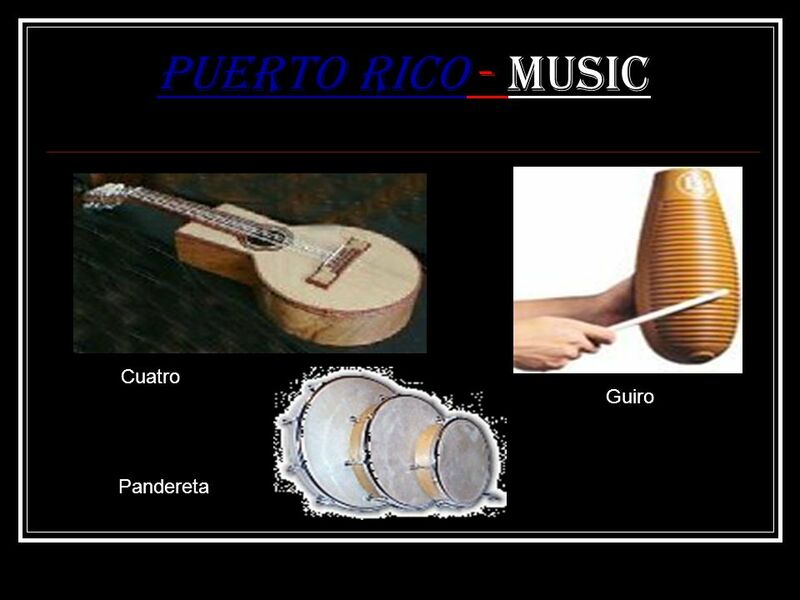 Students will differentiate the musical styles and sample the cuisine of Puerto Rico. Students will design and construct a model of a tropical home suitable for the geographic conditions in Puerto Rico. Students will produce a passport page containing information learned while studying Puerto Rico. 15 The Puerto Rican Flag The Puerto Rican flag is NEVER officially flown alone. It is always accompanied by the flag of the United States. RED represents the blood shed by patriots in the struggle for freedom. WHITE is for purity and the high ideals for which they fought. The TRIANGLE is a reminder of the ideals of the revolution: Liberty, Equality, and Brotherhood. The lamb is the symbol of peace and brotherhood. The Latin inscription translates “John is his name”. 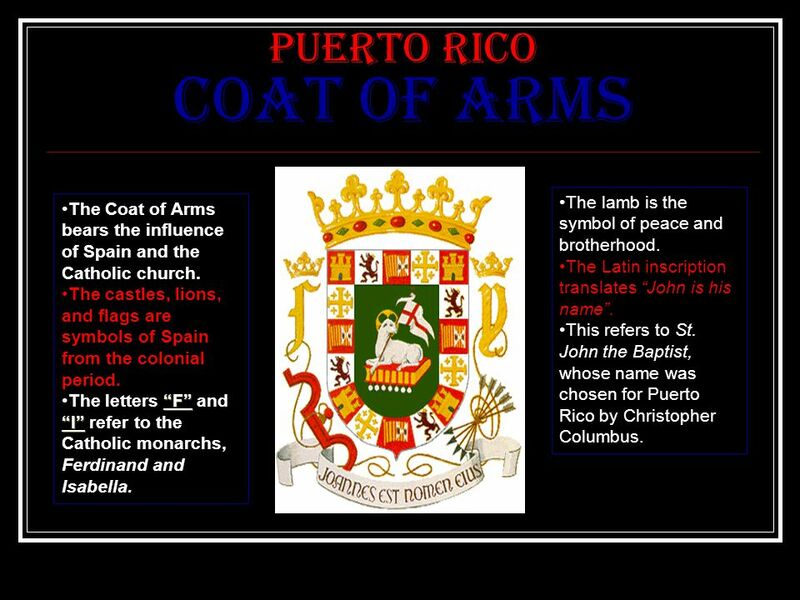 This refers to St. John the Baptist, whose name was chosen for Puerto Rico by Christopher Columbus. The Coat of Arms bears the influence of Spain and the Catholic church. The castles, lions, and flags are symbols of Spain from the colonial period. The letters “F” and “I” refer to the Catholic monarchs, Ferdinand and Isabella. Puerto Rico is an organized territory of the United States with commonwealth status. 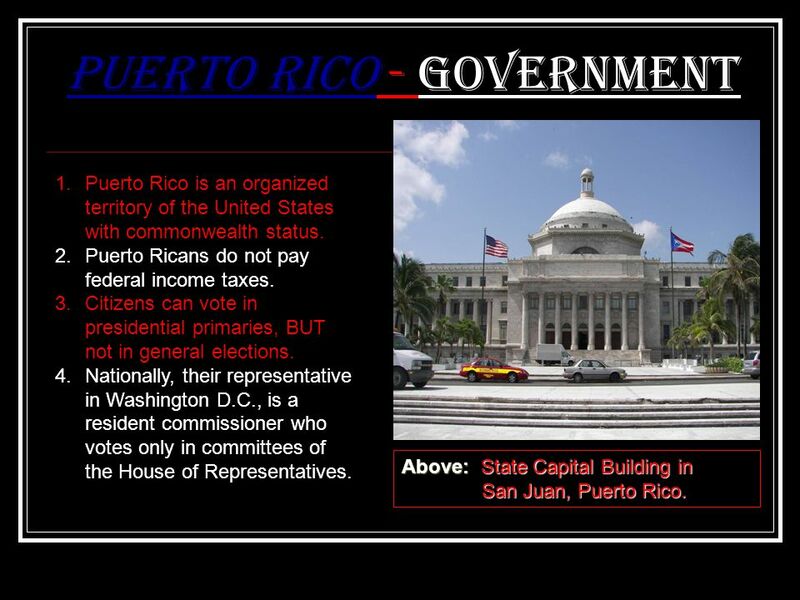 Puerto Ricans do not pay federal income taxes. Citizens can vote in presidential primaries, BUT not in general elections. Nationally, their representative in Washington D.C., is a resident commissioner who votes only in committees of the House of Representatives. Above: State Capital Building in San Juan, Puerto Rico. Puerto Rico - Economy Puerto Rico’s Economy consists of: 1. Agriculture main crop is SUGAR Livestock & Dairy Products Coffee Fruit (pineapple, plantains) 2. 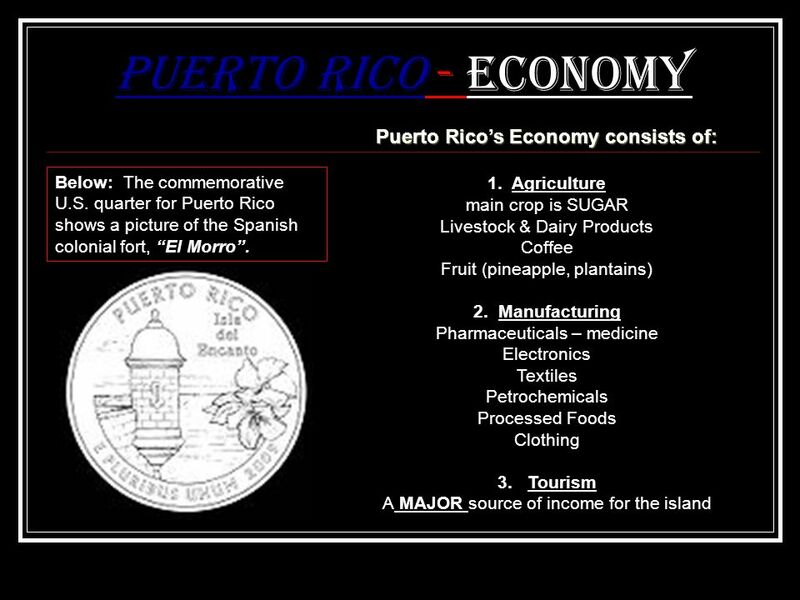 Manufacturing Pharmaceuticals – medicine Electronics Textiles Petrochemicals Processed Foods Clothing Tourism A MAJOR source of income for the island Below: The commemorative U.S. quarter for Puerto Rico shows a picture of the Spanish colonial fort, “El Morro”. 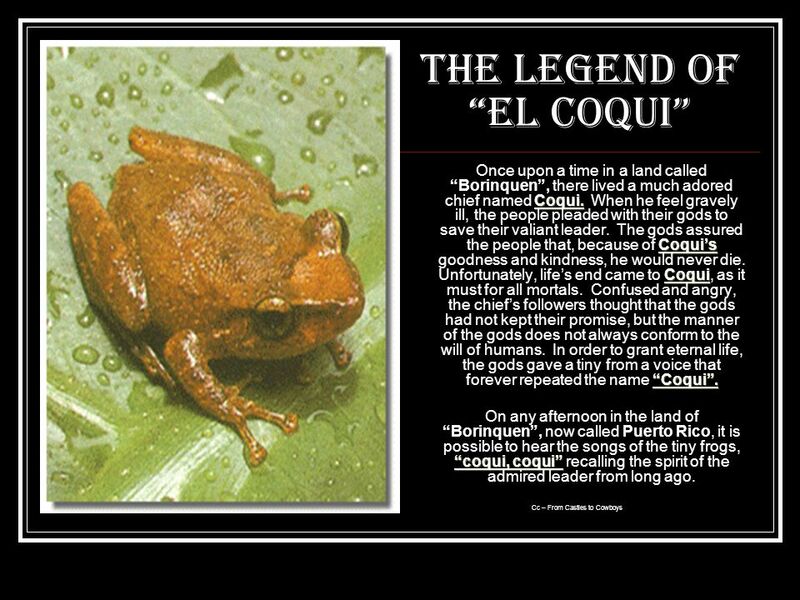 Borinquen – The Taino Indian name for the island of Puerto Rico. The Tainos were the original inhabitants of the island. 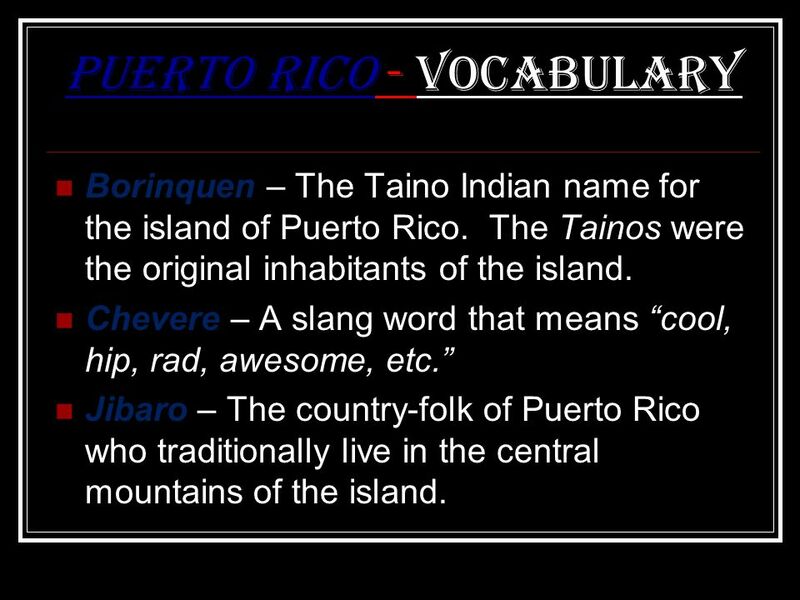 Chevere – A slang word that means “cool, hip, rad, awesome, etc.” Jibaro – The country-folk of Puerto Rico who traditionally live in the central mountains of the island. 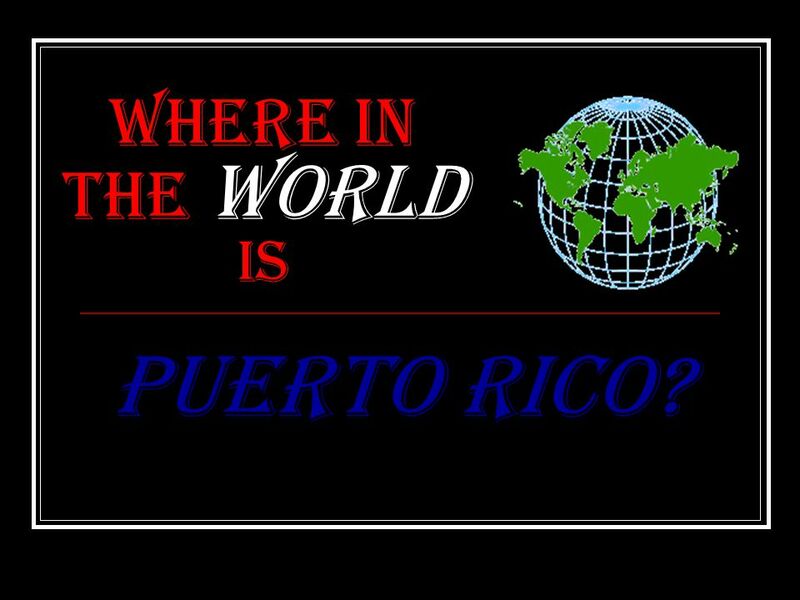 Download ppt "Where in the World is Puerto Rico?." Juan Ponce de Leon By: Matthew LoPresti. Missions Alive !. Antigu a Antigua Flag Antigua’s sister island is Barbuda, a 15-minute plane ride away. Antigua has 365 beaches, one for each. Please grab out: a writing utensil, notebook/blank paper, your folder, and book. Please answer the following bell-ringer and remain silent after you are. Jeanette Holmes Liberia “Land of the Free” Back to Home Page. What I KNOWWhat I WANT to knowWhat I LEARNED. Puerto Rico By Anni Kristen Watson. 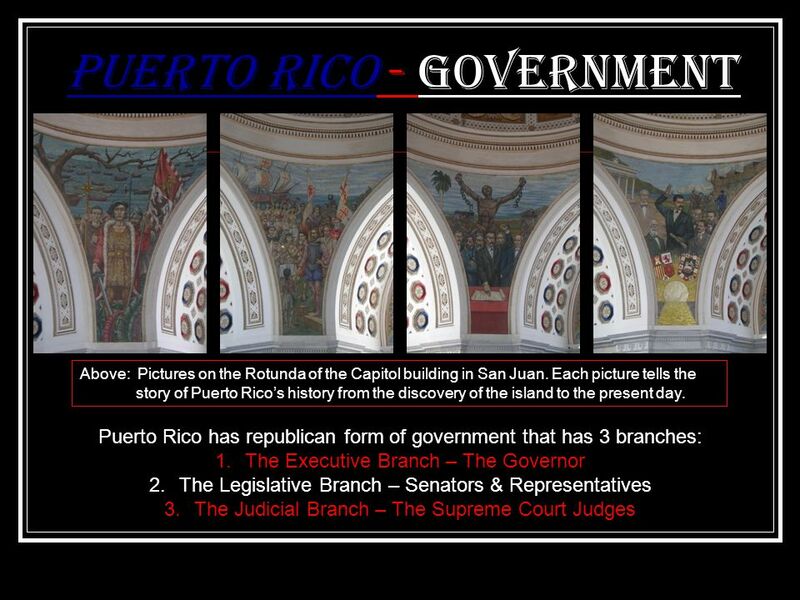 History Of Puerto Rico. Puerto Rican Island Adventures History of Puerto Rico by Maureen Ryan. Puerto Rico Unidad 3. Puerto Rico  Official name of the country is Estado Libre Asociado de Puerto Rico.  It consists of one main island and several. Chapter 2 Culture Puerto Rico. Population: 3,937,316 Capital: San Juan Official Language: Spanish and English Government: Free State Associated with the. Puerto Rico Unidad 3 / Lección 1. ¿Dónde Está Puerto Rico? Puerto Rico By DaRon Smith. 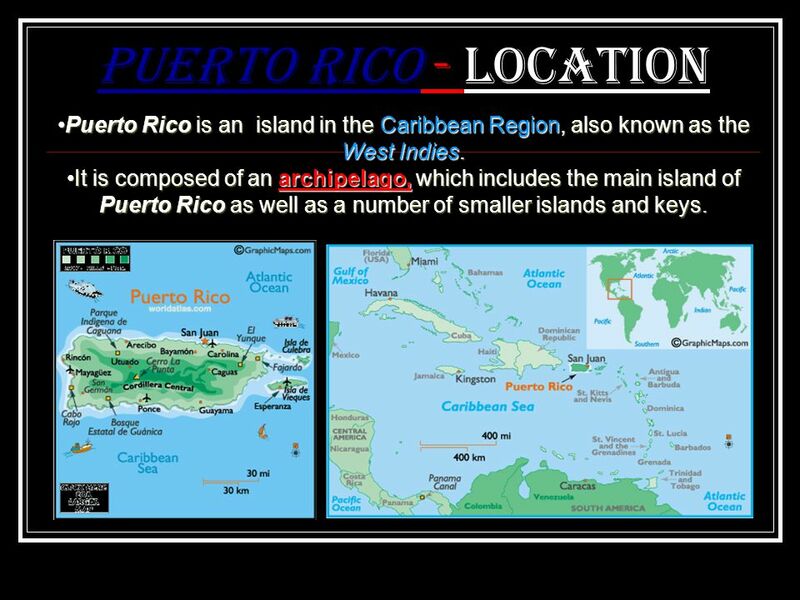 Description/Location Puerto Rico is an unincorporated territory of the US. Puerto Rico is an unincorporated territory of the. ¿Cuánto sabes de…? Puerto Rico. ¿Cuánto sabes de…? Puerto Rico ¿Dónde está Puerto Rico?  By: Josselyn Gonzalez and Lianna Graniglia. 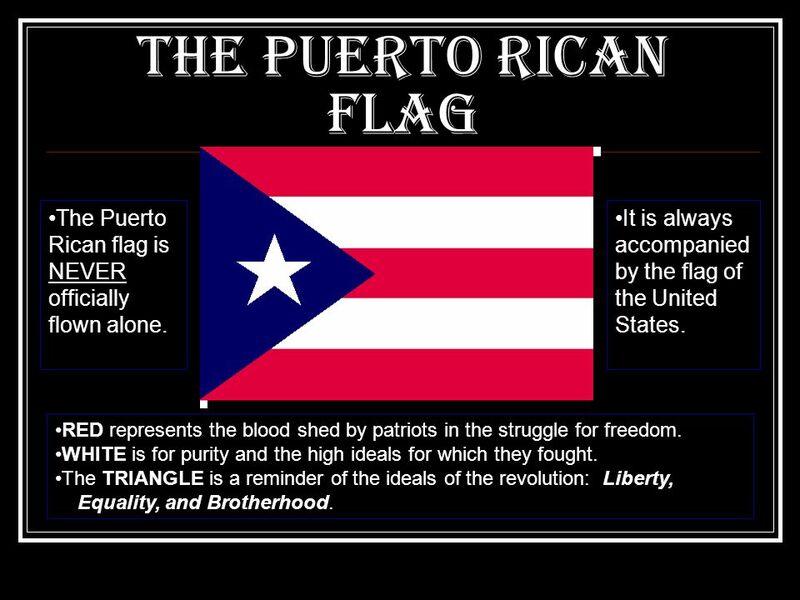  The Puerto Rican Flag The Puerto Rican Map The white star stands for the Commonwealth of Puerto Rico. By Ricky Costa EDC 448 April 17, 2014 PUERTO RICO.